The time changes of photoluminescence (PL) characteristics of porous silicon (porSi) powder during storing in different ambients have been reported. 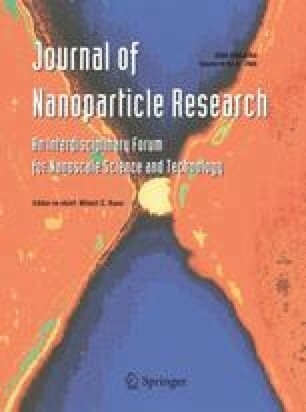 A porous silicon material with embedded Si nanocrystals of size of few nanometers was prepared by an electrochemical method from 10 to 20 Ωcm p-type Si wafers, and both constant and pulse current anodization regimes were used. A powder with a submicron average particle size was obtained by simple mechanical lift-off of the porous layer followed by additional manual milling. The air, hexane, and water as storage media were used, and modification by a nonionic surfactant (undecylenic acid) of the porSi surface was applied in the latter case. Dependence of PL characteristics on preparation and storage conditions was then studied. A remarkable blue shift of a position of PL maximum was observed in time for porSi powders in each storage media. In water suspension a many-fold build-up (10–30) of PL intensity in a time scale of few days was accompanied by an observed blue shift. Photoluminescence time behavior of porSi powders was described by a known mechanism of the change of porSi PL from free exciton emission of Si nanocrystals to luminescence of localized oxidized states on the Si nanocrystal surface. This work is a part of the project PSY-NANO-Si financed under the contract NMP4-CT-2004–013875 by the European Community and co-financed by Ministry of Education and Science of Spain, MAT2006–27447-E, and Valencia Community, ACOMP06/016 and ACOMP/2007/209. LB acknowledges his support from the Ministry of Education and Science of Spain (grants SB2005-0064).